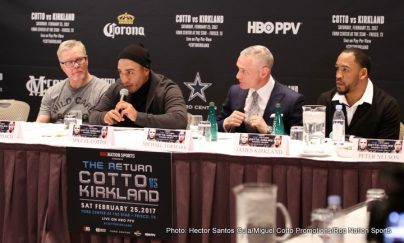 Five-Time World Champion Miguel Cotto (40-5, 33 KOs) and James “Mandingo Warrior” Kirkland (32-2, 28 KOs) participated in a media tour with stops in New York City and Los Angeles to address the media on their upcoming showdown on Saturday, February 25 at Ford Center at The Star in Frisco, Texas. 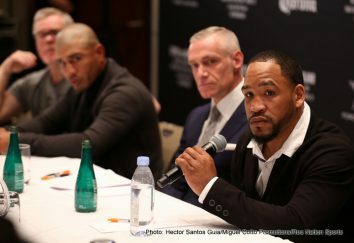 Dubbed as “The Return”, the 12-round junior middleweight contest will be produced and distributed live by HBO Pay-Per-View® beginning at 9:00 p.m. ET/6:00 p.m. PT. Tickets priced at $304, $204, $154, $104, $79, $54 and $29 not including applicable service charges and taxes are available at all Ticketmaster locations, online at Ticketmaster.com, charge by phone at (800) 745-3000 and the AT&T Stadium box office. “James is a tough fighter and stout boxer and he’s going to go to work with victory on his mind. I’m going to work with that, too. We are going to start camp today with Freddie and we are looking forward to the fight. “I will do my best as always in Los Angeles with Freddie Roach commanding our group. All we need is to be ready for Kirkland. “It’s going to be a great fight, I know that James always comes with a wiry attitude. And I’m going to do the same. “I’m here for the best fights and the best fighters out there so if Canelo Alvarez wants to fight, to clear what happened November 2015, they know where to find me. It was close. We orchestrated the plan in a perfect way and we believe that we were the winners of the fight. “I’m going to do the same as always with Freddie Roach. We’re going to work hard and have a game plan in mind. We’re going to work for James Kirkland. “I’m committed to this fight. I’m committed to look the best possible for February 25. Freddie is in charge of my camp. Freddie is the captain of the boat. I trust him and I know I am going to be ready for February 25. “It’s good to be back. It’s good to be sweating. I know that Freddie has everything set for our training camp. I rested a lot. I healed. And now I am ready to fight. “Jerry Jones is a great promotor. I have a lot of respect for the Dallas Cowboys organization. It’s great to have them support this event. 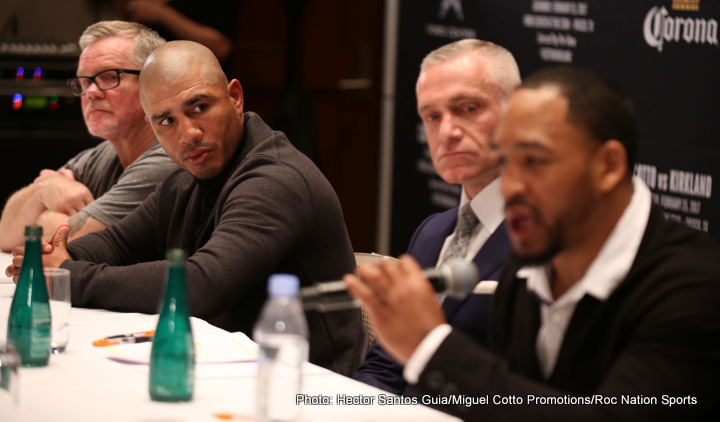 “I’m definitely going to put on a great performance against an icon and legend like Miguel Cotto. “I definitely feel this is a step up. Like I said, it’s Miguel Cotto. Someone who’s been putting on for the sport of boxing for a long time and I’m definitely feeling like this is a great opportunity for me to bounce back. I’m definitely going to give my fans a great performance. “I feel it’s a lot different with Ann. They say if it ain’t broke, don’t fix it. Dealing with Ann, we have a certain trust factor with each other when it comes to the training and techniques and things that we do to prepare for any fight. Bringing someone who knows me from the beginning back to the fight game and training Kirkland, it’s overwhelming on both ends. She’s a person that you feel in this atmosphere, the boxing game, who can push Kirkland to his ultimate limits. “I’ve been training with Ann for so long. Everything that she put me through, or whatever situation might come with training with Ann, I feel like it was always worth it. She pushed me to the ultimate limit but never broke me down, never wear and teared my body, and always has put me in a great position for my performance. “I just have one agenda, one focus, one mind frame and this is set for February 25. “Boxing is always a learning experience. And I’ve learned from fighting Alvarez and certain people that I’ve made mistakes against. I take those mistakes and I build from them. I try to learn. I’ve learned a lot from my defeats. Biggest thing that I’ve learned is move your head! “I’m more focused than ever. 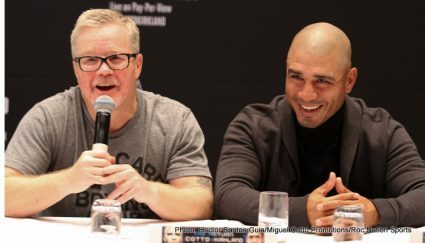 Cotto is somebody who has fought all of the greats so I know that he has many tricks up his sleeves and that he prepares well for his fights. At the end of the day, to fight someone who knows the sport, I think about what would he do and how he would feel about certain things. I try to get in the head of Miguel Cotto when I’m training. I’m anxious for the opportunity and I’m thankful for the opportunity. “If Miguel Cotto didn’t have a lot left, I wouldn’t be here. He’s great in the gym, he’s always in shape and he keeps himself close to weight, all the time. He’s tremendous. He works hard. If he didn’t look great in the gym, I wouldn’t let him fight. I care that much about him. He will be 100% ready for this fight and if he’s not 100% for this fight, it won’t happen. 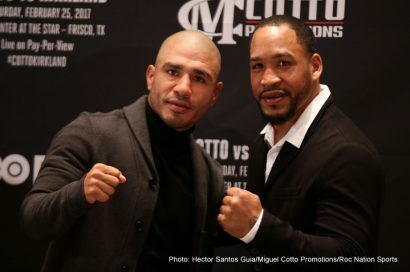 “On Feb. 25 at Ford Center at The Star, we will witness the big return of boxing legend Miguel Cotto. This is the first pay-per-view fight of the year and this will be Miguel Cotto’s 10th pay-per-view fight of his career. I know there has been some stories and comments out of the market, pre-holiday, regarding the pay-per-view status of this fight. 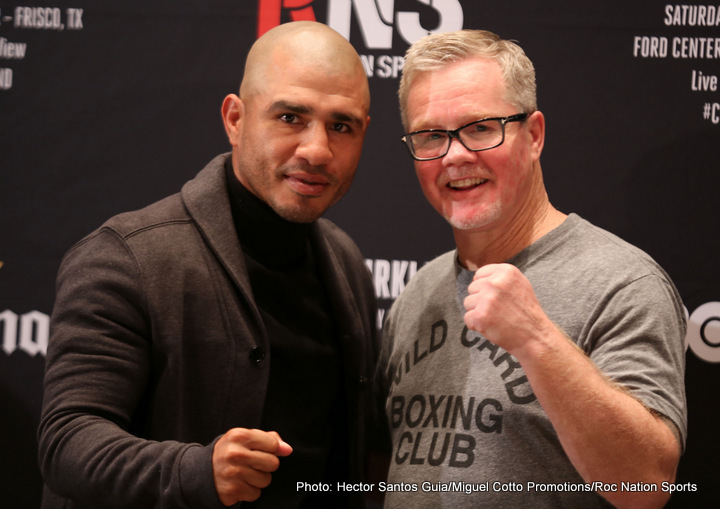 Miguel Cotto has been a pay-per-view fighter for a long time. He is a pay-per-view fighter. This fight belongs on pay-per-view. “We priced this fight very attractively, $49.95. We listened to consumers, we heard what they wanted to see. HBO heard what they wanted too which is why we priced it at $49.95, a great value proposition. Think about what this fight is going to be…action packed…and will probably end in a knock out. So people who buy this fight can anticipate a lot of action, hard punching and probably a knockout. That is what people what to see, that is what they are willing to investment their money in if they are confident that they are going to get it. “James Kirkland is an aggressive and lethal opponent. The perfect opponent for Miguel Cotto. From the opening bell, you are going to see action. That is what this fight is all about. For as long as it lasts, it’s going to be a brawl and whoever wins this fight, will move on to a huge fight in 2017. So, there is a lot at stake here. “It’s all about entertainment and it’s all about value proposition. We know that people want to see this fight. The local market place is telling us that. We have sold over 50% of our tickets during the holidays. Now typically as you know, people don’t usually buy tickets during the holiday but we ‘ve got a great partner in Jerry Jones and the Cowboys, who have really been promoting this fight, very aggressively. We’ve sold over 50% of the inventory with seven weeks to go so people are showing that they want to see this fight. “Fans can decide how they want to watch the fight or if they want to watch the fight. Ultimately, what you see is that the original pay-per-view was whether or not fans are buying tickets for a fight. As Michael just laid out, that’s already happening, you’re already seeing momentum. People know that this is an incredibly high-quality pick up match between Cotto and Kirkland, and that’s what people show up to buy and people want to see. 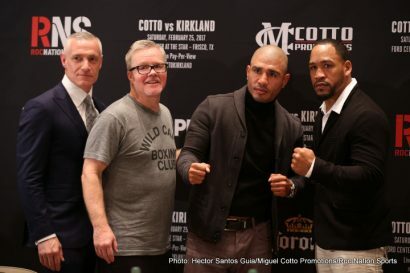 Cotto vs. Kirkland is a 12-round junior middleweight fight presented by Roc Nation Sports and Miguel Cotto Promotions and Ford Center at The Star, and is sponsored by Corona Extra. The event will be produced and distributed live by HBO Pay-Per-View® beginning at 9:00 p.m. ET/6:00 p.m. PT.